Do not adjust your screens: St. Patrick’s Day has passed for another year. 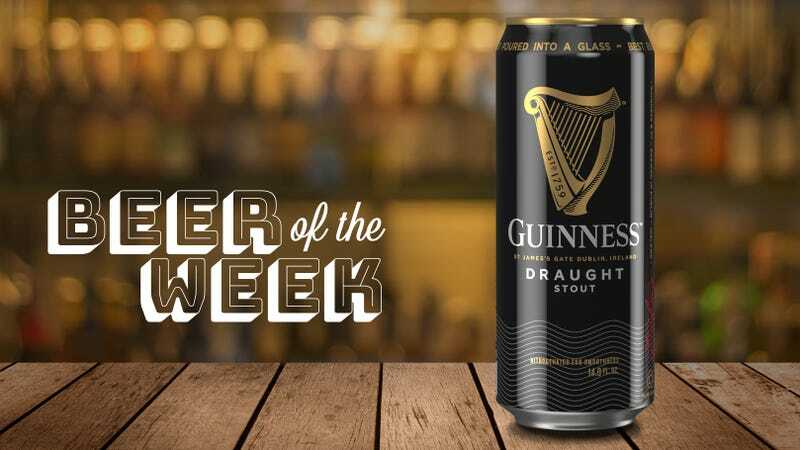 But I’m pulling a little surprise move here and recommending Guinness Draught Stout as the beer of the week after March 17. Here’s why. Guinness in America is too often relegated to a St. Patrick’s Day novelty, when it truly deserves a place in our drinking rotation year-round. If you can’t remember the last time you had a Guinness, it’s time to reacquaint yourself. For me, it’s the ideal dry stout. Running counter to all the marshmallow, cherry, and pastry-laden stouts brewers concoct these days, the classic Guinness has always been dry, roasty, clean, and not at all syrupy. Its flavors of light chocolate, espresso, and dry almond shell derive from the specialty malts used, not from additions of chocolate powder or coffee beans. Guinness is also here to dispel the idea that dark beers are heavy or intense. (If you encounter a doppelbock or imperial stout before you try a dry Irish stout, you could be forgiven for thinking this.) It’s only medium in body or texture, but the nitrogen gas Guinness uses to carbonate this beer—both on draft and in a can, producing that cascading effect and the beautiful, moussey head—make it seem creamier than other beers. While it’s creamy, it’s also quite dry and light—and just 4.2 percent ABV. A couple seasons ago when I still held out hope for my New York Giants, I almost solely drank Guinness at the bar where I watched the games. It was mild and easy-drinking enough to drink a few of over the course of an afternoon, and its coffee-roast notes seemed especially appropriate during the early games. It’s really a session stout, and one that I’d suggest we all embrace more than once a year. Guinness Draught Stout is available nationally; check its availability near you.